Of course, one might wonder how large the field of view (FOV) of the Atik Infinity camera is when you connect it to a particular telescope, because this determines whether you will see sky objects completely or only partially, small or large. 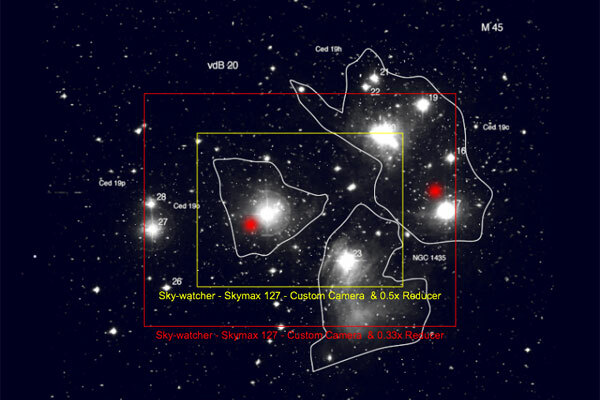 Some nebulae and open star clusters, as well as the Andromeda galaxy M 31, are widely extended, often over several degrees, whereas others, such as globular star clusters or the Ring Nebula M 57, are just a few arcminutes wide. 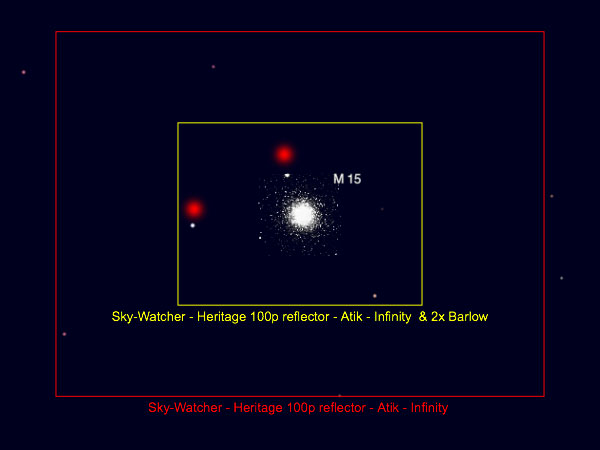 If you know the field of view that you get with the Atik Infinity at a certain telescope and, if necessary, with focal length extenders or reducers, then you know what you can expect and which objects can be sensibly approached for observation. This page is therefore dedicated to the topic of "field of view" (FOV), starting with formulae that contain the focal length of the telescope as a key element. This approach is then extended to the use of focal length extenders or reducers (Barlow lenses, focal extenders, focal reducers) - provided that you can rely on the specified extension or reduction factors. I also show how I compared my results empirically with the results of an online calculator for determining the field of view and that I found a sufficient match. But what can you do if, for example, you cannot trust the listed reduction factor of 2 or 3, especially if the manufacturer already indicates that the factor depends on the specific conditions? At the end of this page, I therefore present one or more approaches to determine the field of view and the (here: reduction) factor under these conditions. Of course, one might ask how large the field of view of the camera is when you connect the Atik Infinity to a specific telescope. In the following you will find some formulae for calculating this and a table with results for some selected telescopes (mine...). As you can see, only the focal length of the telescope is of interest. In order to obtain the field of view for the sensor of the camera, one has to multiply this value by the number of pixels of the corresponding sensor side (see also the formula of Oden below). The factor "3600" might result from the Atik formula indicating the angle in seconds. The dividend "1000" is probably due to the conversion from mm to μm. In the following, I describe an empirical test in which I measured the field of view in two photos with the help of two prominent stars and compared this data with the results of an online field of view calculator using the same stars. First, I calculated the field of view using the field of view calculator on Astronomy.tools (Website provided by First Light Optics Ltd). I entered the Heritage 100P, the Atik Infinity camera, and once a 2 x Barlow lens and once again "without Barlow lens." I compiled both results in one picture (this is easily done with the online calculator) that is presented below at the center. For the following, the field of view frames and the two "measurement stars" are needed. 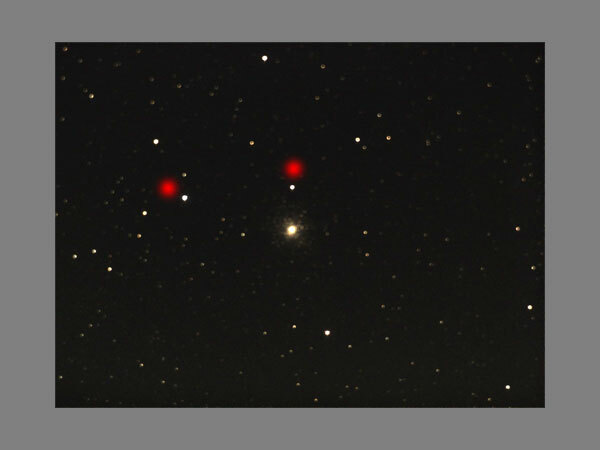 For comparing the fields of view, I measured the distance between two prominent stars, horizontally and vertically, using a marquee rectangle in Photoshop Elements. I determined the length of the diagonal, that is the distance, according to the theorem of Pythagoras*; die results are given below the images. In both of my pictures, the distance is slightly larger than in the simulation, but I think that the match is sufficient. *) Actually, spherical trigonometry would have to be used, but for small angles, the "planar" geometry is a good enough approximation (and easier to calculate). In the meantime, I was pointed to another field of view calculator on the Sky at Night Magazine (BBC) Website! I have only photographed the Pleiades M 45 and the Andromeda Galaxy M 31 with the Skymax-127 so far. Because these are extended objects, I used my 2 x TS focal reducer with an 25mm extension tube. For this combination, the manufacturer lists a reduction factor of 3 x, but notes that this factor depends on the actual conditions. I tried to empirically determine the actual reduction factor using Astronomy.tools and a photo that I took of M 45 (Pleiades), using the pixel distance between Alcyone and Electra as a "scale." For this, I let the fov tool draw frames for a 2 x and a 3 x focal reducer and set the star distance in relation to the total widths of the frames. I did the same for the photo. M 45 taken with Skymax-127 and focal reducer, the distance between Alcyone and Electra was used as "measure"
Field of view: 0.77° x 0.58° = 46" x 35"
All values are, of course, only approximate because of the inaccuracies involved! 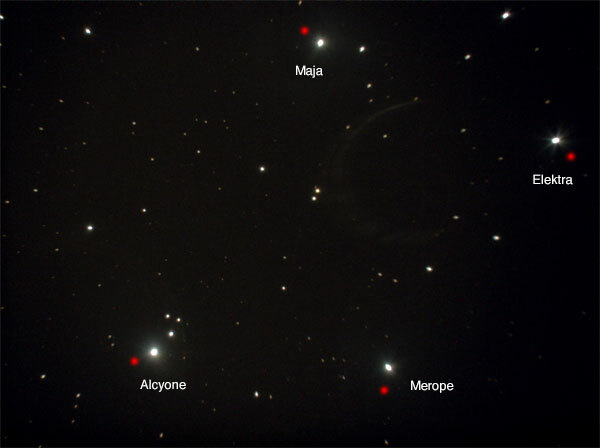 I used the same photo of M 45 as above where I had marked the stars Alcyone and Electra in it to measure the angular distance. I ran an astronomy program and retrieved the position data for the two stars Alcyone and Electra (RA and Dec in universal coordinates). 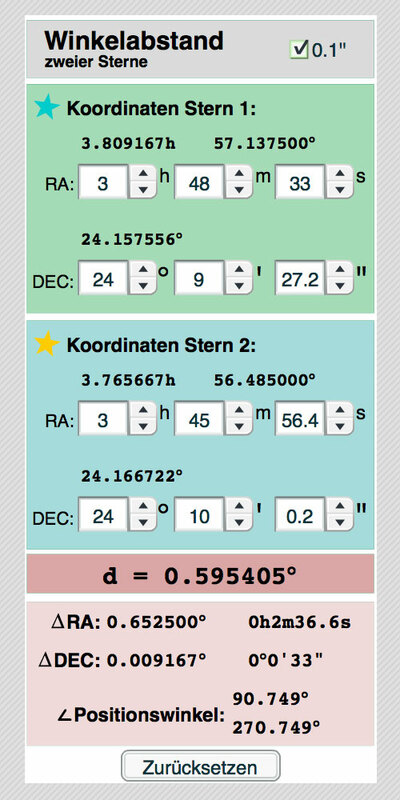 I searched the Internet for formulae for calculating the distance between two stars. In this process I learned that spherical trigonometry has to be used. 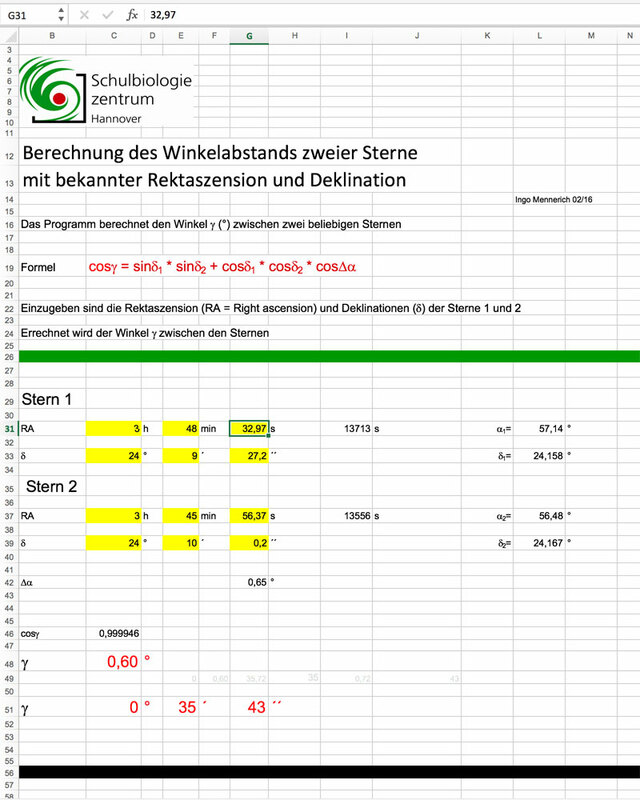 I also found an online calculator for star distances and an Excel worksheet for their calculation on the Internet. With both calculators I determined the star distance. 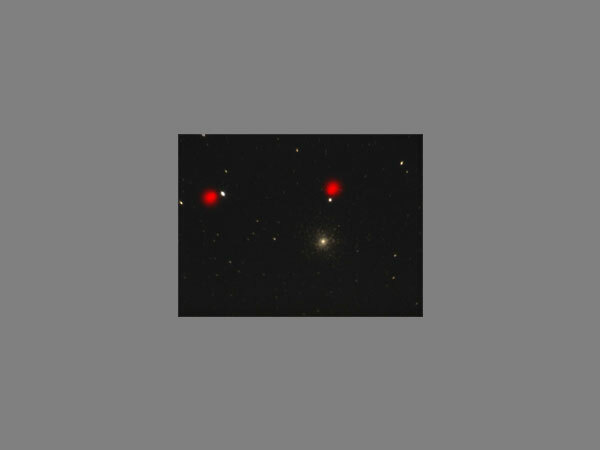 I measured the distance in pixels between the two stars and put it in relation to the image width (sensor width). With the appropriate factor, I calculated the angular width, that is, the field of view, for the sensor. I get the reduction factor using the field of view for the telescope with focal reducer divided by the field of view without reducer (previous bullit point). Both calculators arrived at a star distance of 0.6 degrees (or 35' 43"). I had measured a pixel distance of 1055 pixels between the stars in the photo. This is 0.7579 of the width in relation to the sensor width of 1392 pixels. On the other hand, the photo is 1.32 times wider than the stellar distance, leading to a field of view of 0.79 ° or 2850" = 47.5' = 47' 30", which is a little more than what I had calculated using the other method. Field of view: 0.79° x 0.59° = 47.5" x 35.5"
All values are, of course and despite of the many calculations, only approximate because of the inaccuracies involved! And as I demonstrated, there is also a way without the help of the field of view calculators from Astronomy.tools or the Sky at Night Magazine. On this page, I laid down the fundament for determining the field of view of the Atik Infinity camera at different telescopes and with focal length extenders and reducers, even in the case that the extension or reduction factors are not exactly known. Other hobby astronomers should be able to transfer this to their equipment.